When computers were real, and I mean the ZX Spectrum, the BBC Model B, the VIC-20 and all manner of 8-bit machines that booting straight into a BASIC interpreter (with a nod of the hat to the Jupiter ACE of course! ), there was a little publishing company called Usborne who produced the most amazing books on computing. Now many of those books from the 1980s have been released free via their website. 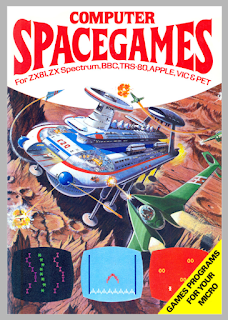 On pages 24 and 25 is a listing for a game called Space Mines - a very simple simulation game based on selling ore for food and mines. That particular game got typed in, played with, modified, reimplemented and I guess in no small way started my love of simulation games which more than likely led to me writing a language for implementing simulations ( BSc degree final year project ) and later trying to simulate the behaviour of systems from their formally specified models ( PhD thesis ). So to Usborne, the writers, editors and everyone involved in those books, especially the person or persons who wrote "Space Mines" my deepest, heartfelt thanks! (C)2011 Ian Oliver. Awesome Inc. theme. Powered by Blogger.